The holiday season is chock-full of reasons to get dressed up, and holiday party dresses are some of the most fun to shop for. And when you're really looking to make a statement without totally blowing your gift shopping budget, Rent the Runway comes to the rescue. They gave us some insight into their holiday dress learnings this year -- and as such, what the women in 10 major U.S. cities are wearing to celebrate the season. We don't know about you, but these dress trends just feel so perfect for each city. Of *course* Dallas women are wearing gorgeous, statement-making off-the-shoulder dresses, and the elegance in Houston makes their gown choices perfect. Seattle will be the sparkliest city this holiday season: 20% of orders going to Seattle contain sequin items. Philadelphia will be wearing the most lace this holiday season: 20% of Philadelphia orders contain lace items. 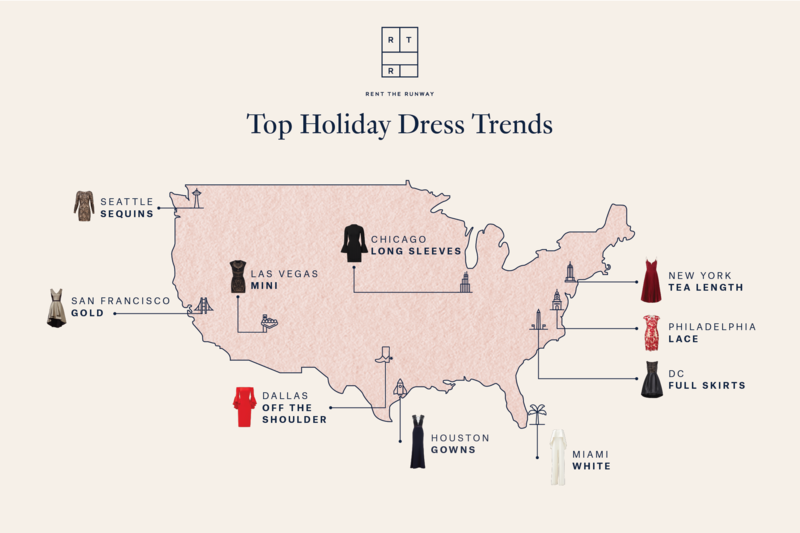 Houston has the dressiest holiday events: 30% of orders contain gowns! Las Vegas women will be showing the most leg: 16% of Vegas orders contain mini dresses. Surprisingly enough, Philadelphia will rent more black items than New York City, 28% of orders and 27% of orders, respectively, contain black items. Washington, DC women will embrace the full skirt this holiday season more than any other city: 18% of DC orders contain full skirts. What are you wearing for your holiday parties this year? Do you agree with your city's style, if it's on this list? Let us know in the comments!